“I just wanted the right to vote.” How many of us take that right for granted? 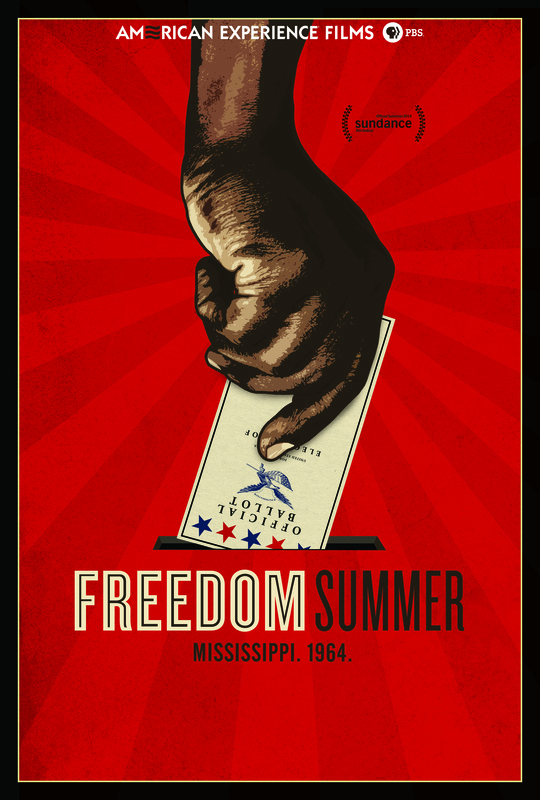 In his powerful and poignant new documentary, Freedom Summer, filmmaker Stanley Nelson reminds us that a mere five decades ago, voting was virtually off-limits to Mississippi’s African-American community. Contrived literacy tests and threats of home and job loss, violence and death were the tactics used by the segregationist white establishment to bully black Mississippians out of the polls and elected office. As the summer of 1964 dawned, only 6.7% of African-Americans were registered to vote in Mississippi, in contrast to 50-70% in other Southern states. While African-Americans made up the majority of the population in rural Mississippi, they remained frozen in time–tipping their hats and bowing their heads as their white neighbors strolled by. Mississippi Summer Project volunteers and locals canvas for new voters. Photo: Ted Polumbaum/ Newseum. Somehow, Mississippi had fallen off the radar and remained the land that time and the rest of America forgot. 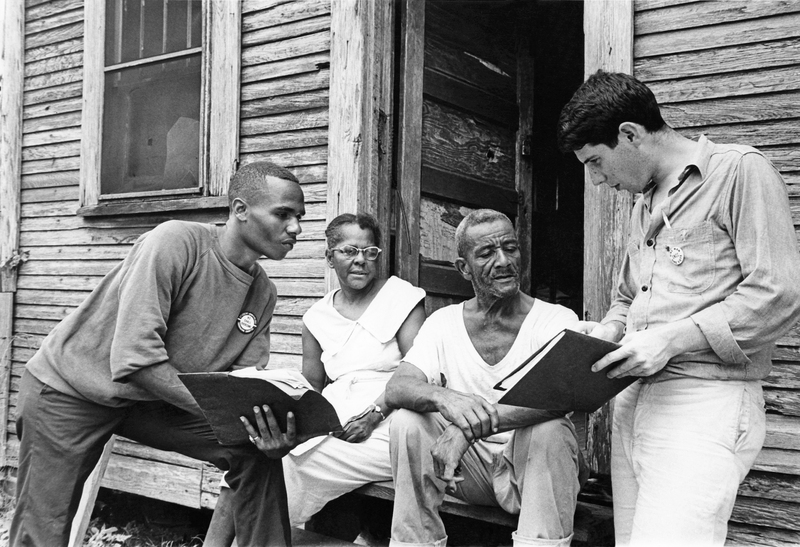 Until, that is, the Mississippi Summer Project aka Freedom Summer was launched by the Student Nonviolent Coordinating Committee (SNCC) to transport almost 1,000 white and black student volunteers down from the North for 10 weeks to aid local civil rights activists in their efforts to register black voters. Freedom Summer clearly sets the stage on which these idealistic young Northerners (average age 19-20) found themselves. Mississippi was in the grip of the Citizens’ Council, who answered any perceived threat to white supremacy with violence. 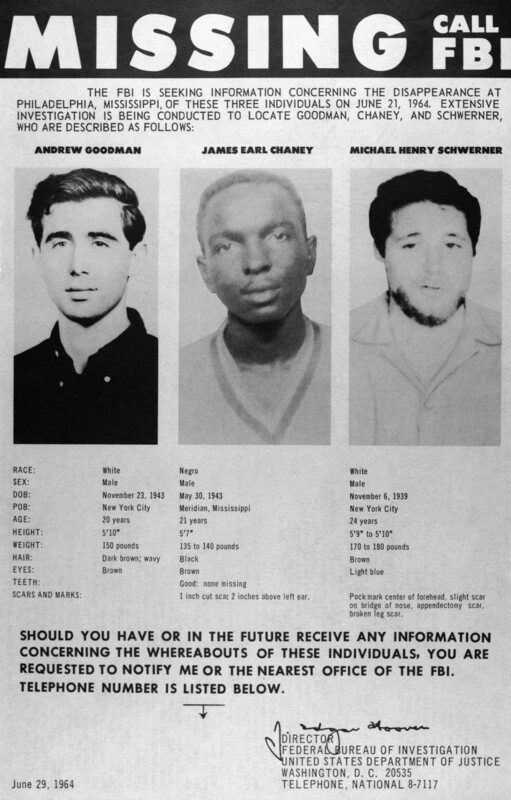 Early casualties were Mickey Schwerner, Andrew Goodman and James Chaney, who disappeared en route to investigate a church bombing. Their bodies were later found buried in shallow graves. The summer played out with beatings, the burning of 35 churches and bombing of 70 homes and community centers. Freedom Summer seamlessly integrates well-chosen period archival and news footage, photos and letters with articulate recollections by surviving volunteers, organizers and civil rights leaders who reflect on what they faced, how they survived the ever-present fear of being shot, tortured, raped or killed and what they garnered from their commitment. Their stories are often chilling. Standout witnesses here are the women who departed states like Iowa, New York and Vermont as fervent but naive young volunteers, as well as the locals who opened up their homes to them at great personal danger to themselves and their families (African-Americans housing white young women were especial targets). Anthony Harris, then a youngster and now a Ph.D., is a particularly engaging witness. He attended a life-altering Freedom School set up by the volunteers to introduce young African-American Mississippians to literature (blacks were barred from local libraries) and to the black history and culture they were sorely missing. 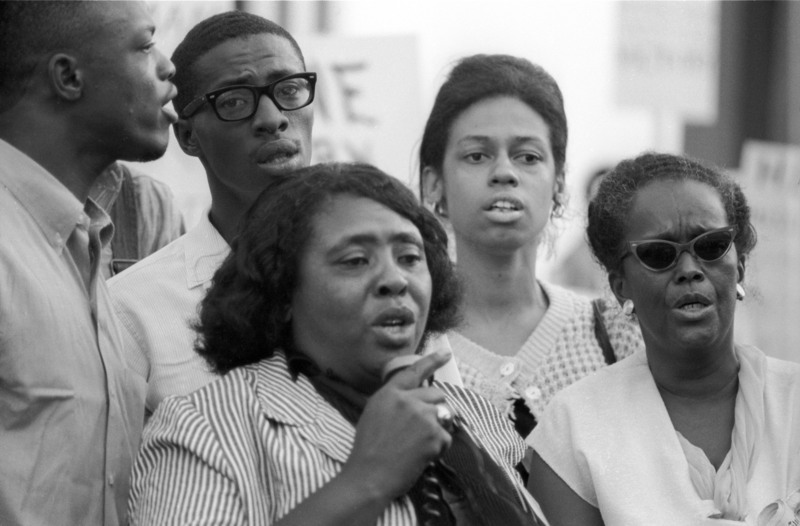 Fannie Lou Hamer rallied volunteers and the nation with pleas for justice and voter rights. Photo: George Ballis/Take Stock. Two fearless women posed a special problem for President Lyndon Johnson, who opposed the black voter registration drive in Mississippi, afraid it would cost him the next election. Fannie Lou Hamer, a sharecropper and SNCC field secretary, passionately supported unseating the all-white Mississippi delegation at the Democratic National Convention in Atlantic City; and Rita Schwerner, a Freedom Summer organizer and the young widow of Mickey Schwerner, worked relentlessly to keep her husband’s loss and memory alive in the public eye. The film includes snippets from what appear to be Oval Office phone conversations, including those between LBJ and F.B.I. Director J. Edgar Hoover, that are pretty damning, as are the backdoor machinations used by LBJ to stifle the Mississippi Freedom delegates at the National Democratic Convention. And yet, once elected, LBJ is shown signing the Voting Rights Act of 1965, abolishing literacy tests and protecting voter rights in the seven Southern states. 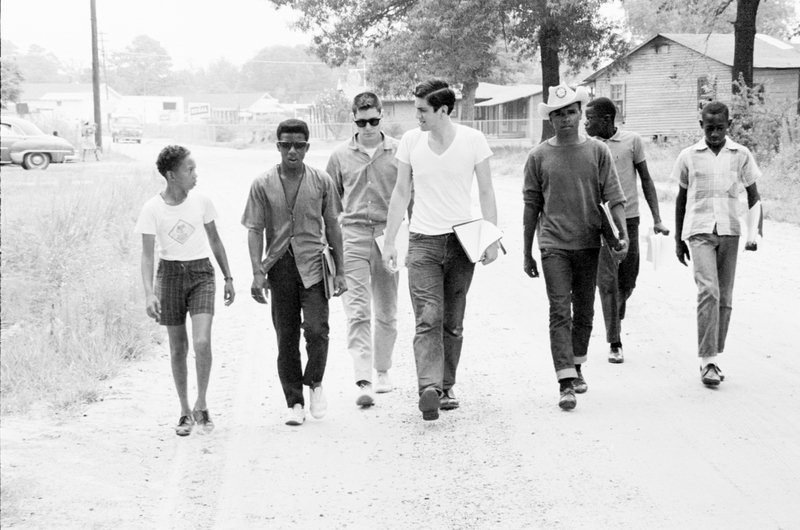 A direct result of the volunteers’ daunting efforts during the summer of 1964, the relevance of the Voting Rights Act of 1965 can’t be understated, nor can the importance of this film as a reminder of a time when a long hot summer brought courageous young people of both races together to make a difference. Volunteers Johnny Waters, Ceola Wallace and Jake Plum explain voter registration procedures to Willie McGee. Photo: Johnson Publishing Company LLC. This entry was posted in Film, TV and tagged African-American Studies, American Experience, Andrew Goodman, Fannie Lou Hamer, Freedom Summer, James Chaney, Mickey Schwerner, Mississippi Freedom Democratic Party, PBS, Racism, Rita Schwerner, SNCC, Stanley Nelson, Voter Registration. Bookmark the permalink.